A comedian once noted that reporters of shark attacks always sound surprised: “A man was attacked by a shark at the beach today!” Well, how surprising can it be if sharks live in the water? As Quint (Robert Shaw) said in the original and best JAWS (1976), “Cage goes in the water, you go in the water, shark’s in the water…” The comedian noted he’d be surprised if there was a shark attack DOWNTOWN. Ipso facto, JAWS 2 spends so much time neck-deep in sea and surf it’s no surprise everybody’s getting eaten. Not directed by Steven Spielberg (rather, Jeannot Szwarc, who has the distinction of having one of his movies featured on MST 3K – CODE NAME: DIAMOND HEAD, which he directed just prior to JAWS 2 – some pedigree he brings to the table! ), and missing two of the major characters from JAWS (Dreyfuss and Shaw), JAWS 2 was sunk before it was launched. 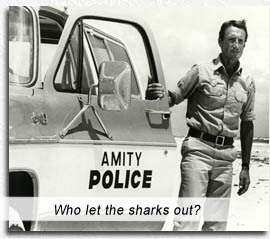 Roy Scheider reprises his Sheriff Brody from JAWS (the only one who seems to be taking all this seriously – his acting job and his Sheriff’s job), Lorraine Gary is still his blond-suffering wife, the mayor is still Murray Hamilton and he and his council elder nutjobs are still in-denial when a new killer shark threatens their tourist trade on Amity Island. There’s no denying the events in the first movie happened, which makes the mayor even more incredibly insane – when Sheriff Brody alerts him to the new shark, he might as well be reading his sides from JAWS, as he poo-poos Brody’s assertions and warnings. Has the man no short-term memory? The climactic threat this time is towards Brody’s two young boys, one of them a typical 70’s teen – anti-authority, bad hairstyle, terrible acting and worse looping. But we feel no sympathy for any of these people who have heard all the warnings, lived through the first shark frenzy in JAWS, and still insist on putting their warm, salty bodies in the open sea. Writers: Peter Benchley, Carl Gottlieb, Howard Sackler. Starring: Roy Schieder, Lorraine Gary, Murray Hamilton, Joseph Mascolo, Jeffrey Kramer, Collin Wilcox Paxton, Ann Dusenberry, Mark Gruner.